I didn’t want to know the details of the shooting deaths of the two TV news folk in Roanoke. I didn’t want to let it unduly upset me. I had to work hard to make that happen Wednesday. Though stories kept popping up on my desktop Wednesday, I declined to read them. In recent years, I have tried not to dwell on the details of all the repeated incidents of gun violence in America. I don’t dwell on the details because I am numbed by the frequency and scope of the carnage. When some guy entered an elementary school and killed 20 tiny children and six adults in Connecticut, I read every detail. I got upset. When Congress declined to act on gun violence following that massacre, I decided I needed to stop letting mass killings upset me. The Washington Post calculates that there has been, on average, more than one mass shooting in America every single day in 2015. 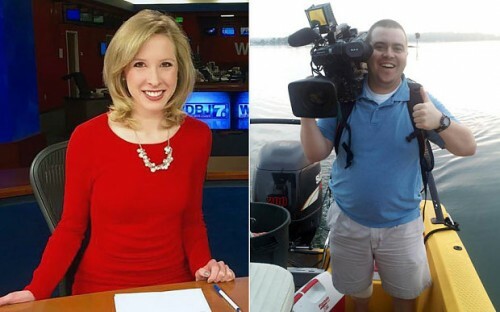 I care that the young lives of Alison Parker and Adam Ward of WDBJ-TV were snuffed by a handgun-toting fool in Roanoke. I do care. When I allow myself a few sideways glances of their images on the internet — seeing but not studying their smiling young faces, committing acts of television the same way I’ve done for a gazillion years — I do see a reflection. I lament their loss and the grief of their friends and family. It is about the senseless violence that befell them. It is not, emphatically, about me and the other folks who toil in my business who are, perhaps, allowing themselves to wonder if they might be next. Because the answer is yes, they might be. I might be. But so might you. So might all of our families and friends and other strangers whose acquaintances we make only after we read about something horrible befalling them. The TV news business has its dangers, and they are acknowledged only infrequently. A few weeks back, in the northwest Atlanta neighborhood known as The Bluff, I heard gunfire too-close to where I was doing a 5pm live shot. We calmly packed our gear and did our 6pm live shot elsewhere. In late spring, a mob assaulted a WAGA photographer who was covering a story late at night in a rough part of town. But Parker and Ward were covering a feature story at the crack of dawn at a location where one could not reasonably predict danger. They were targeted by a madman. Just like the kids in Sandy Hook. Just like all the innocent adults killed in workplace violence. So what befell them wasn’t their occupation. It was a madman. And yes, madmen with a sense of planning and a flair for publicity could target other TV folk doing live shots in a fixed, public location with only their live trucks to shield them. Maybe they’ll bear a grudge against members of a mostly unpopular profession. Our industry does have its vulnerabilities. The trend toward using one-man-bands in major markets remains troubling. In addition to doing the work of two people, they lack the extra set of eyes which could potentially warn against somebody aiming to do harm. Yet the folks who died in Roanoke were working as a two-person team, not solo. Out in the world — where TV news folk are frequently welcomed but often scorned — we are merely human beings asking uncomfortable questions and bearing the logos of news operations. Madmen lusting for blood have target-rich environments wherever they go. We are merely one of them. My situational awareness is my shield. In a parallel way, so is my numbness. I am, darkly, an optimist. My odds of surviving a workday are quite good. So I care about my safety, and that of my colleagues. But I’m not going to let the Roanoke killings unduly upset me. I’m not going to let that horrific violence prevent me from standing in a public place tethered to a TV camera. Maybe I’ll be a target. But sadly, none of us is safe– regardless of what we do for a living. Since writing this post, I’ve scoured the internet for images of Parker and Ward, and begun to read their stories. Ward was “vivacious and funny.” Parker is described a genuinely shining light at WDBJ whose likability is evident in a video the station made touting “7 fun facts about Alison Parker.” Watching that video — and finally reading about her and Ward — have shaken my resolve to avoid getting upset. I would like to extend my sympathies to their families, friends and coworkers. This entry was posted in workplace safety on August 27, 2015 by live apt fire.